Welcome to my Samsung Mobile SDK Tutorial, which is part of my Android Development Tutorial. Over the course of this series I will take a look at many of the tools provided by the Samsung Mobile SDK while continuing to cover how to write code for Android in general. I’m doing this series of tutorials because Samsung currently controls over 32% of the smart phone market (Apple controls 12% in comparison) and yet there are many more iOS tutorials then Samsung tutorials. I think that is a bit odd? I hope to solve that problem while also continuing to teach Android specific coding. Don’t forget to check out the Samsung Smart App Challenge and if it is still November 2013, don’t forget to sign up to win a Samsung Galaxy Note 3, or Samsung Galaxy Gear Smart Watch on my site. // settings for the page document. // Is this a Samsung device? // Is the SDK library installed? showAlertDialog( "You need to install additional Spen software"
+" to use this application." + "You will be taken to the installation screen." + "Restart this application after the software has been installed." showAlertDialog( "You need to update your Spen software "
+ "to use this application." + " You will be taken to the installation screen." + " Restart this application after the software has been updated." showAlertDialog( "We recommend that you update your Spen software"
+" before using this application." 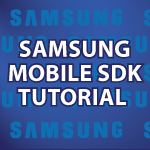 I’m very excited to provide you with my Samsung Mobile SDK Tutorial! Over the next few videos I cover: the Samsung Mobile SDK. Thanks to the nice people at Samsung and the Samsung Smart App Challenge, who are giving away $1.1 Million in prizes. I’ll also be offering a give away. Between now and November the 30th, sign up for a free Samsung developer account at http://developer.samsung.com/signup and you will be eligible to win a Samsung GALAXY Note 3 device or one of three Samsung GALAXY Gear smart watches. I will choose a winner at random. After you signup for the Samsung developer account, leave a comment on my website stating that you signed up. That is all! Just finished signing up for the site and i use your material and really really revere your wisdom! Signed up for a developer account. Hopefully I can get somewhere in the app challenge. Keep up the good work! Thank you 🙂 You very well may get your wish for the Galaxy Gear. I guess they are hard to find. I wish you the best of luck. I signed up for a developer account on samsung. I am learning to develop and your tuts really are a great help. Informative and quick, Best tutorials I’ve seen (I’ve seen quite a few. When I start making money I will definitely help support your efforts. I’m very happy that I could help make what your teacher was covering easier to understand 🙂 Good luck in the contest. Hey Derek, great collab with Samsung! just leaving my comment that I’ve signed up for a Samsung developer account. Yes I hope this works out for them so i can give you guys more free stuff. It is very cool. Good luck in the contest. I have signed up for a developers account. Great, you are entered in the contest 🙂 I wish you the best of luck. I’ve already signed up for the Samsung Developer Account. I have signed up for my Samsung Developer account and look forward to the rest of this series! Great! I hope you enjoy it. Apparently I already had a samsung account, but it throws an error while entering (not from password). Well I signed few years ago, so the long time has maybe caused it. But I don’t care that much if I’m not in competition for that reason. I just thought I’ll give a change for my luck 🙂 . Hey Derek ! Thank you for your vids , i learnt a lot about android developing from them. I have signed up for a samsung developer account and hopefully ive qualified for your giveaway too! I signed up! Thanks for making these tutorials Mr. Banas. Hey there, I just signed up. Looking forward to future tutorials! Thoroughly enjoying your tutorials, thank you very much! Just signed up for the Samsung developer program. thx for the great tutorials btw! I have signed up for the samsung account. Thank you for your tutorials and making this competition happen! Thanks for your great tutorials. Very appreciated. I just signed up for the Samsung Developer Account. I signed up for the Developer Account. Thanks and keep up the good work! Hi Eric, Good luck in the contest 🙂 You’re very welcome. I just want to thank you ALOT for being the most helpful human on earth ! I’ve learnt many programming languages and watched the whole Java playlist . will be there some electronics stuff ? like Arduino maybe ? I’m very excited to see your future video tutorials ! what ever it will be . I signed succefully on samsung developer website. Hi, Thank you very much 🙂 I’m very happy that I was able to help. I definitely want to cover electronics since I have been doing a ton of work using custom made tools together with Android in the real world. I’ll hold a vote on the tutorial that will replace C soon. I signed up for the Samsung developer. Just started watching your videos and i think their great! I’m probably going to use some of your tutorials to help me do my java final for school. I have signed up for a developer account. I’m currently working my way through Java but hope to start Android soon. I actually used my Java knowledge to write a nice program which dissects the HTML results file from an orienteering race and creates a text file with the chosen runners times compared to the best times (per kilometre and overall every kilometre etc.). It’s really nice to copy to a blog for a race report and has saved people interested a tonne of time as they used to write up a similar layout on their blogs manually! Best of luck in the contest. Hello Louie, Best of luck in the contest. Derek, I have signed up for the Samsung developers account. Thanks a lot to post all these learning videos for developers like me. Hey derek, I’ve been going through your tutorials lately and they’ve helpedme learn several new things. I was also going through some topics I already knew (like your html and css tutorials), and even those were refreshing. I look forward to your samsung series, I’ve got an old galaxy s captivate I used for starting android development and my daily carry for the last few years has been a galaxy nexus. Ironically I’ve never looked twice at samsung development so I’ll be following you through this. I’ve registered on samsungs developer website in hopes of nabbing some contest prizes or maybe a gn3. Either way this is a push in the right direction for me, I applied for the tegra development kit a while back and sort of gave up on OEM specific development when they never contacted me back. Thanks and keep up the good work! Hello Derek, Just signed up for a Samsung developer account. I signed up. Thanks for the videos. Also thanks a ton for your Android series! Sooooooo awesome :D. This new series is looking great too! Thanks for giving your time to help me learn. I have made a Samsung Account. I have signed up with Samsung! hi ,I made a Samsung account ..
Hi Derek, I signed up. I really admire what you do. Keep it up. Thank you 🙂 Good luck in the contest. I’m happy to hear that 🙂 Good luck in the contest. I’m very happy to hear that you are finding the videos useful 🙂 Good luck in the contest. Signed up for Samsung’s developers account. Love your tutorials, very clear and helpful. I made a samsung developers account. I realy like watching your videos and I would love to win one of the samsung devices. I hope I will get the Note III. Thank you very much d’or everything you are doing for us here.